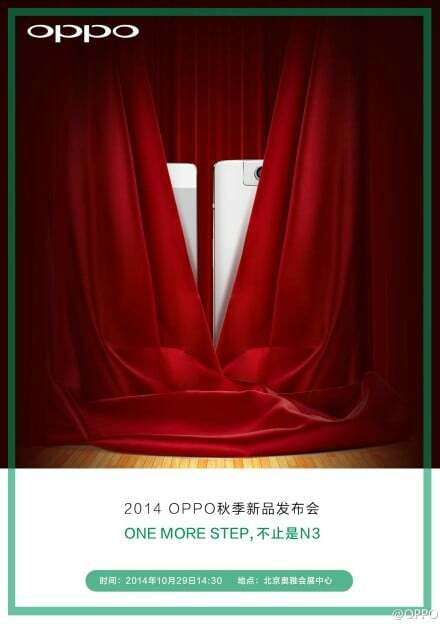 Oppo is expected to unveil its next flagship smartphone, the N3 on October 29. Prior to the announcement, Oppo has posted a teaser image on its official Sina Weibo account which shows two devices side-by-side. The company had earlier announced that they would release a variant of the Oppo N3 which would use lithium-aluminum alloy in its construction which is said to be very sturdy unlike aluminium. Other specifications of the Oppo N3 might include a 5.9-inch 1080p display, a Snapdragon 805 processor, 3GB of RAM, a 16-megapixel 1/2.3-inch swivelling camera sensor, and a fingerprint sensor. There wee rumours that it would be priced around $700 but whether this price is for the more premium lithium-aluminium alloy version, or the normal variant, is not known yet. We all know that the OnePlus One was based on the Oppo Find 7. Would you be happy if OnePlus Two was based on the lithium-aluminium alloy version of Oppo N3?